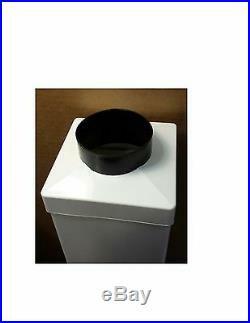 Helps to eliminate moisture, mold, and mildew; reduces harmful radon. 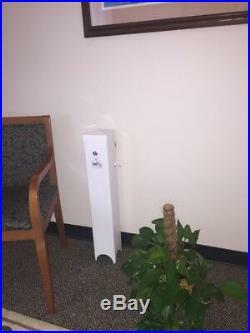 Automatically maintains humidity level. Replaces moist, foul-smelling basement air with dry fresh air. A rugged product that is made in USA (patent pending). 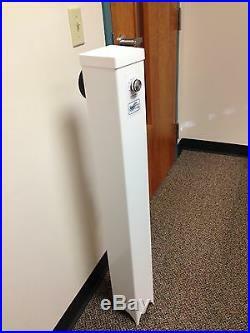 Need a more powerful unit (for basements that are over 1,000 square feet or those with a significant humidity problem)? Need a crawl space unit? Uses electricity of 2 or 4 (double fan units) night lights! Tired of a basement that you can’t use because it’s damp and musty smelling? Get a Breeze of fresh air! The Breeze is an energy efficient, maintenance-free, house ventilation unit that exhausts foul, humid air and replaces it with dry, fresh air. Made in the USA with rugged materials automatically controls humidity designed to run continuously (if necessary) easy to install costs a fraction of the price of similar units. Compare with Wave Ventilation, EZ Breathe, and Humidex systems especially the price! Take back your basement with the Breeze!! Introducing Breeze “Mini” At 30, the Breeze Mini is perfect for finished basements, where the customer doesn’t want to see a tower unit. 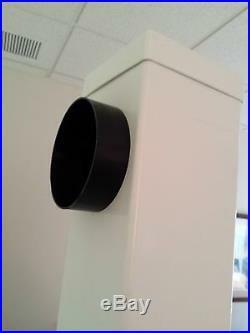 Comes with behind the wall ductwork, in single or double fan models (see photos). 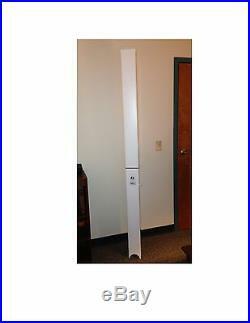 Product Dimensions: 7 x 5.5 x 80.5 inches ; 13.1 pounds. Origin: Made in USA. Item model number: Breeze BreezesystemsinternationalDOTcom. 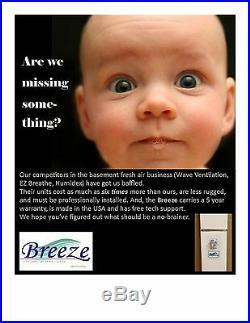 You are now a proud owner of The Breeze, a revolutionary appliance that will rescue your basement by. Making it a place you can actually live in. This product was developed out of sheer frustration over the expense of running a dehumidifier constantly with little. Change in the basement smells and no fresh air. Unhappy with that scenario, we undertook a search for an appliance. We found similar products, but their cost was outrageous! That, in short, is what gave rise to The Breeze. It is a product. Created of frustration and necessity. ASSEMBLY: The Breeze is simple to assemble in eight easy steps: FIRST: Decide where to locate the appliance, usually. Near a basement window. If you have any combustion (open flame) appliance, like a boiler, furnace, or non-electric hot. Water heater, place The Breeze on the side of the basement opposite the open flame appliance. SECOND: Make a 4. 1/8 hole in the side of your home (or building) from the basement to the exterior to vent The Breeze, just as you would. With a dryer vent you may want to call a clothes dryer installer to vent The Breeze; just get their price for installing a. You may also replace a pane of glass in a basement window with a Plexiglas pane that has a 4 1/8 hole. (available through us in custom sizes) for the vent. THIRD: Mount the upper part of The Breeze the part with the. Exhaust port in the rear on top of the lower part, sliding it over the flange. FOURTH: Attach one end of the flexible. Exhaust hose to the 4 exhaust vent at the top, rear of The Breeze using the irreversible plastic tie by making a circle. With the tie and tightening it over the flexible hose, which is placed over the flange at the top, rear of The Breeze. Put a bead of exterior, silicone caulk around the outside of the flange of the exhaust vent, and mount the exhaust vent. Onto the outside of the Plexiglas pane for non-window holes, attach the flange of the exhaust vent to the outside of the. Building at the 4 1/8 hole; attach the other end of the flexible exhaust hose to the flange of the exhaust vent, using the. Irreversible plastic tie as you did for the other end. SIXTH: Place The Breeze at the location of the exterior wall that you. Have chosen for it; make sure it is straight (use a level if you like) and mark lightly with a pencil the place where the two. 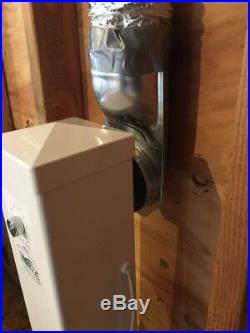 Mounting blocks on the rear of The Breeze touch the wall; gently remove the plastic backing to the Velcro tape and put. The Breeze in place, then firmly press it against the wall so that the tape sticks to the wall at the two marked locations. Set the humidistat to the desired humidity (generally between 44% and 55%). EIGHTH: Plug in unit. OPERATION: The fan is designed to run constantly. The Breeze uses less than the electricity required for two. Depending on the size of your basement and the humidity level, you should see a difference within a week. Or two of operation. If you have a lot of cardboard boxes or other items that absorb odor, you will have to remove them. From the basement (replacing them with plastic or other storage containers) to fully remove the bad odors. Have places where air from the upper levels can enter the basement e. The space under the basement door; space. Around water pipes and forced air ducts. If your basement is particularly tight, you may want to leave the basement. Door slightly ajar, or trim the bottom of it to allow some air to pass. Remember, the Breeze not only removes humidity. From the basement, it brings fresh air into it and reduces harmful radon gases in the process! You may see some light, surface scratches. On the Breezes housing. The housing was originally made for a different application; its use in the Breeze. Explains why we can sell the product at the price you paid for it. Enjoy the Breeze and your rescued basement! Let us know if you have any questions or problems. We want to make. Sure that your experience with the Breeze is as amazing as ours. Your Breeze Support Team. 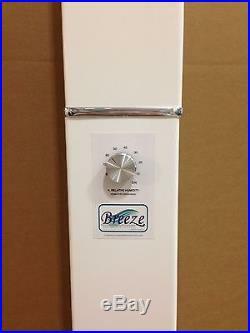 The Breeze is like several other products on the market that perform the same function. There are a couple of appliances that sell for about as much as the Breeze, but they are made in Canada of sheet metal, that both rusts and dents easily; one has controls up near the ceiling. I don’t know anything about the quality of their component parts. Our product uses the highest quality parts that ensure many years of reliable operation. Our product exemplifies the old adage, necessity is the mother of invention. My family members and I were never able to spend much time in our basement because of the quality of the air. 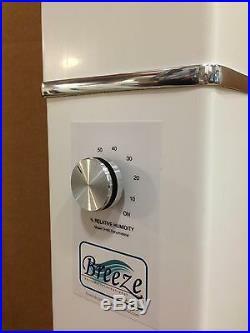 I researched all of the products on the market and decided that there was no way that I would pay that much for such an appliance, so my son and I designed and manufactured the Breeze. The concept is simple. The most humid and toxic air in a basement is at the floor; The Breeze takes that air and exhausts it out of the house. That process draws dry air from the upper living quarters of a home, which is also refreshed by slow entry of fresh outdoor air (through leaks from doors opening, bath and kitchen exhaust fans, and small gaps to the outdoors). I have bad breathing allergies and was, as a result, driven from our large basement because of the humid air, despite the fact that we had a dehumidifier running nearly constantly (at considerable cost). Once I installed The Breeze (after about a week of constant operation), I was able to use the basement freely at all times. The Breeze is designed to run continuously (if the humidistat calls for that) without a problem and at the cost of keeping two night lights on (8 watts), literally pennies. At maximum capacity, the fan moves 115 cubic feet of air per minute. That means that a basement with dimensions of 30′ x 45′ (a square footage of 1,200) and a height of 7′ will experience complete air change in about one hour and fifteen minutes. 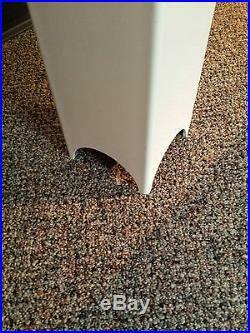 The housing may have superficial scuff marks that do not affect operation. The Breeze installs just like a dryer vent. It must vent to the outdoors. The hose and vent with clamps or ties come with the product. We need to know the exact dimensions of the present glass and the frame to do so. A carpenter can also drill a hole in the side of the home to install the vent. You can get a fixed standard price for installation by asking the contractor how much would be charged for installation of a dryer vent in the side of the house. The unit does not have a thermostat; it has a humidistat, which will turn the unit on and off depending on the level of humidity in the basement. The purchaser must inform the service department of issues of unsatisfactory performance and afford personnel in that department an opportunity to discover the reason for and correct unsatisfactory performance for a period of eleven months of continuous usage. Unsatisfactory performance consists of a failure of the unit to operate and to reduce humidity levels in the basement of the residence in which it was installed. The Breeze does not correct for water leakage into a basement; it is designed to reduce humidity of a basement that does not have water infiltration issues. Photographs of the basement may be required. 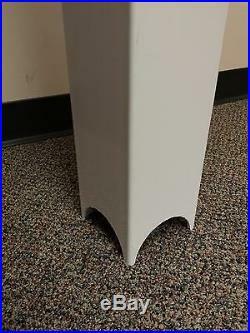 The item “The Breeze basement ventilation system dehumidifier No bucket to empty” is in sale since Monday, December 15, 2014. This item is in the category “Home & Garden\Home Improvement\Heating, Cooling & Air\Indoor Air Quality & Fans\Dehumidifiers”. The seller is “jmmass” and is located in Torrington, Connecticut. This item can be shipped to United States.